We just removed all the paint of our table top. We absolutely love the look but we now get water marks very easily. That’s why I decided that we needed new coasters. Pretty coasters! I bought some cheap ones at the dollar store and created these pretty faux leather triangle coasters with them. Aren’t they pretty? 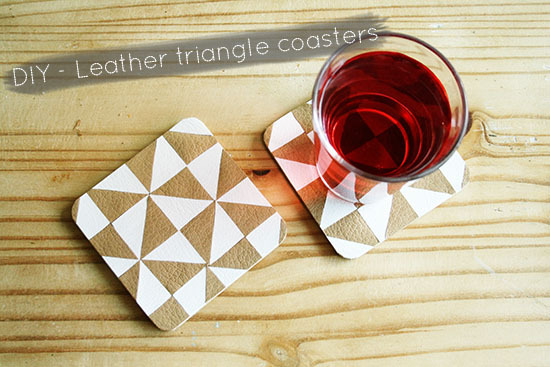 Learn how to create these pretty faux leather triangle coasters after the jump. . .
– scraps of faux leather in two colors. Don’t use real leather on this project. Real leather can get stained from water too! 1. Find some coasters with cork backing an a smooth and hard front. 2. Cut out a small triangle from your cardboard or paper and trace around this on your faux leather. Lay down your coasters on top of it to decide how many triangles you need. If you have 4 coasters you need to be able to cover two of them entirely with triangles in one color. 3. Cut out all of your little leather triangles. 4. Put glue on the smooth surface of your coasters. Use your fingers or a brush to even it out. 5. Glue down all the little triangles on the coasters. 6. When the glue is completely dry you can cut around the coaster to create a clean edge.